Home » Hard candy » Warheads-All Filler No Killer? It’s good to have a brother. Sure, my sweet, doe-eyed punk of a son will never know that joy, but hey-what he doesn’t know won’t kill him, right? Meanwhile, I got a bro. And my big bro looks out for me, on occasion, when his fantasy football team isn’t pummeling mine. But I digress. For Halloween this year, he gave out a variety of treats, including a gigantor bag of Extreme Warheads. Not too many kids came by, so in true Candy Guru fashion (look for a guest review or two coming from him soon), he began to eat them. Sadly, he declared these “spitters”. For those of you not in the know, a spitter is perhaps the lowest candy on the food chain–in fact, it’s almost unthinkable: a candy so bad, you’re inclined to spit it out rather than to finish eating it. In this case, he claimed that these were simply way too sour, and that was that. Back to the part of looking out for me: he gave me the entire bag. Never one to turn down free candy, and for SURE never one to turn down free sour candy, I grabbed the bag with both hands and dove in. So here’s the deal with Warheads-they come in five flavors, but that doesn’t matter. Seriously. They all taste the same, more or less. 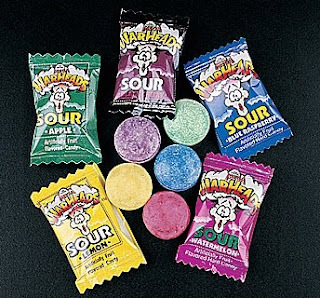 When you pop one in your mouth, as my bro said, you’re hit with a crazy sour rush. And yes, it kinda IS too sour, but…it’s good. And painful. Here’s the rub though-after about 10-15 seconds, the sour coating is gone, totally. And what you’re left with isn’t in any way sour-rather, it’s a sweet, little hard candy. I’m not saying that these aren’t good, but…I don’t get why they’re not sour at ALL after the dusty coating is gone. Why not make the inside more like ZOTS, and continue to be sour? So, I’m left with a middle of the road feeling about these little pain nuggets. If you’re a sour fan, then you need to at least try one of these to get a handle on what too sour tastes like. However, I’m not sure that I can really recommend them, as they get seriously bland very quickly. They’re just painful. I tried, lil bro, I really did. But they just hurt … not exactly the satisfaction I was looking for from a piece of candy. It is good to have a brother, I’ll agree – especially when they are happy to take a bag of spitters off your hands!